Deep under The Midland Hotel in Manchester, a thriving cathedral of marble flooring and polished oak, lies a spa and gym department dripping in technology. The spa and the gym are intertwined, so that you must walk through the former to arrive at the latter. Mood music surrounds you as an automatic door swings open, and glowing cabinets of the finest lotions and potions the spa can offer you are presented. I stand at the spa counter, and quite confidently tell Beth at reception that I am lost. The drawback to having a spa and gym combined is that the doors are shrouded in mystery. You might confidently stride through one to find treadmills and free weights. But you might easily be blasting straight into a customer having a massage. Beth, a chirpy member of the spa team, laughs off my lack of direction and shows me to the gym, spa relaxation area, and changing room facilities. The changing rooms are a soothing mixture of handsome wooden lockers and light tiled flooring. After a fresh clean towel for a welcome, I’m straight into the gym. I’ll be clear at this point, this is no Golds Gym. If you’re expecting a mixture of sweat and protein shakes, you’re in the wrong place. This is for the stamina- and strength-focussed athlete, divided over two floors. Weights on the lower floor, and cardio on the upper. It is not large here. The Midland are compressing as much of the necessary machines into the allotted space, and compensating with hi-tech equipment rarely found elsewhere. I’ll leave opinion ambiguous until the end. I investigate the weights area first. A quick warm up is followed with some leg resistance machines. A few reps in, the screen that accompanies the rest of the quad press machine is noting my reps, sets, and calories burned. After 12 reps at 50kg, I stop my set, and prepare for the next one. Only then do I realise the screen has given me 30 seconds to get myself in gear and go again before the quad press session ends. The manufacturers (Pulse) have stopped short of having an interactive personal trainer barking motivation at me, but it is not a stretch to imagine. This is the layout of the hamstring press, the shoulder press, the chest press and the the full leg press machine. Each with a screen full of monitoring aspects that allow the user to track their progress over their singular use of the machine and note it. The cardio unit upstairs is much the same, with the addition of TV option on its screens. It also comes with a microcable head for one’s iPhone. Some slight favouritism against the Android users of today, but that’s merely a humorous inference. The functional area comprises two coils of battleropes, a selection of kettlebells and a punching bag, all of which are subjected to heavy use as I grind out a sweaty 75 minute session. Afterwards, I head to the wet area. I’m not one for sitting still. In fact, it’s rather like trying to get a bouncy ball to remain still in Apollo 11. But I’m trying here! The pool is warm. Not one for aquafitness or hydrotherapy. You shuffle about and enjoy the extra warm water in it. What draws the attention is the overhead swan neck fountain on the side. That which allows me to perform my ‘Helen Flanagan at the waterfall shower’ scene from I’m A Celebrity! The sauna and steam room are dinky, but as powerful as any I’ve encountered. A steady sweat seeps out of me in the sauna, while in the steam room, I really have to concentrate to maintain my breathing. This is not a detriment to one’s attempt at refreshing oneself. It’s rather liberating to be detoxed in a highly steamed environment. Then, finally, the poolside lifestyle shower. A cosy cubicle which dispenses themed water experiences – tropical, Caribbean storm and Arctic mist. I indulge in all three, and it takes great self-control not to recoil and whimper like a coward as the Arctic mist sprays bring out the goosebumps on me from top to toe! With that, I depart to the showers. Inside a cubicle, there are two shower heads, one at head height, one at the waist. Twisting the activation handle may immerse your head in water, or catch you out completely with a shot of cold water to the waist! Nonetheless, I am equipped with shampoo AND conditioner dispensers, as well as a sweet smelling body wash. I will admit to spending too long in there. It was immensely enjoyable to take a shower in a gym without feeling conscious of anything beyond my own hygiene. Okay, so there are gyms out there with bigger space, this is true. 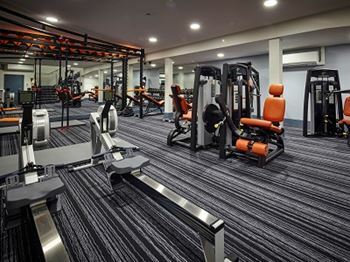 But you cannot fault the Midland, who have done everything to equip their members with the necessities of a modern day gym. The step forward they take lies in the personal trainer app on the machines, which allows for closer reading of the users progress. The spa and relaxation area is a beauty in itself, and even with the greatest will in the world, you will find it difficult to leave it. Instead, just let go. It’s what it is there for. They have refreshment and self invigoration that you just won’t find elsewhere. Join Manchester’s most private gym and become one of just 200 members. Call Claire Watmough on 0161 932 4086 or email midlandleisure@QHotels.co.uk.